Back at CES in January, French company Blade seemed to promise the moon. For a monthly fee, the company would give users access to a high-end Windows 10 machine, with the latest CPU from Intel and a beefy Nvidia 1080 GPU built in. The computer would be housed at a server farm, which means as long as you had an internet connection, your iOS, Android, Windows, or Mac machine could access it. The hiccup was, the service was only available in France and California. Eight months later, Blade’s service, Shadow, is going nationwide in the U.S. The kicker? You only need a 5Mbps connection to take advantage of what Shadow offers. 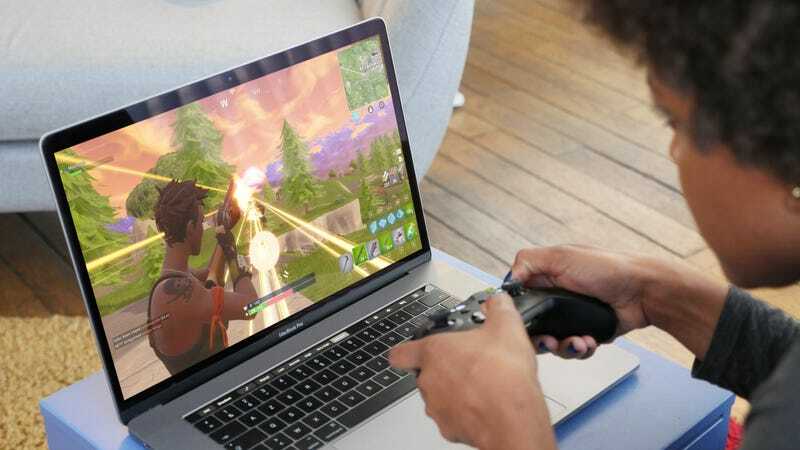 If the rumors are true, streaming the contents of a powerful remote PC to your personal computer, tablet, or phone seems to be one very possible future for gaming. Nvidia already streams games to its 4K set-top box, the Nvidia Shield. Reportedly, both Sony and Microsoft are considering shipping cheap boxes that connect to remote servers for their next generation of gaming consoles, too. In June, Kotaku reported that Google was also considering a similar strategy. While those larger companies currently, and will likely in the future, stream games built on custom operating systems to their set-top boxes, Shadow is streaming an entire damn Windows 10 PC, which means not just games but also other CPU-hungry applications like Blender or Premiere. It makes cheap, underpowered PCs like the Microsoft Surface Go or Samsung Chromebook Plus feel a lot more appealing as a result. The Shadow Beyond app that’s intended for people on smaller screens. Yet until now, there’s been a problem with Shadow’s promise. It had a minimum bandwidth requirement of 15Mbps. That kind of speed isn’t possible in many parts of the U.S. (particularly rural areas). It’s also not possible on crowded networks like you might find at your local coffee shop. And where it can be found, it’s expensive—remember the U.S. has some of the more expensive internet on Earth. The claims are impressive, and while there were a few hiccups in the demo I saw, I was still able to play the newest Ghost Recon game over LTE, pause, and then hop onto the same feed from a MacBook Pro connected to more robust wifi. This stuff, it seems, actually works. Shadow will become available on the East Coast of the U.S. August 9 (it’s already available on the West Coast), and the company plans to have a nationwide rollout by October. If you can spare $35 a month, this could be a viable solution for people who want a big $2000 PC but don’t want to lay out the cash.